Class and Component prices for September were announced on October 1. As shown below, prices were generally up. Class II and III milk and butterfat were at record highs. Butter prices which have been at record prices, hit a significant new record of $2.85/lb. in September. Cheese prices are also near record highs, but the extremely high price of butter/butterfat have kept milk protein prices from reaching similar highs. For an explanation of this relationship, see the August 8, 2010 post to this blog. In this post, each of the key commodity elements influencing producer milk prices will be reviewed. Butter prices are again the real story. 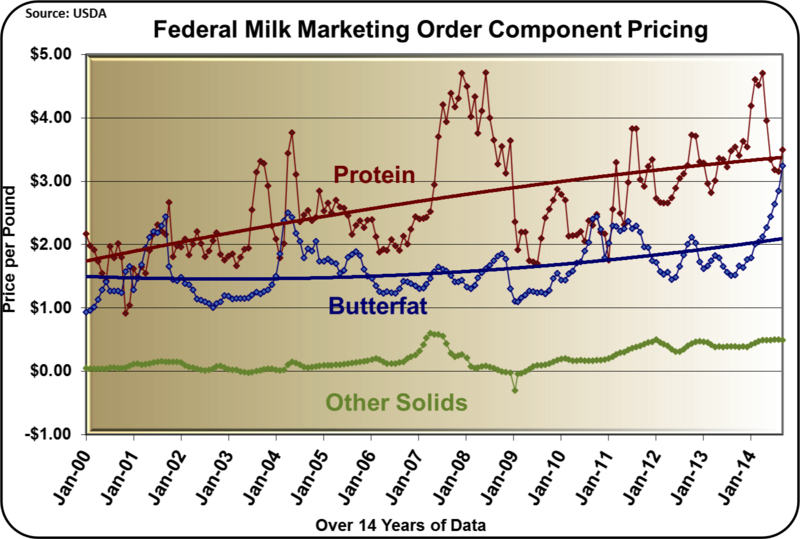 Butterfat prices are driven by the price of butter. Butter has risen from $1.65/lb. at the beginning of 2014, to September's price of $2.76/lb. This has, in turn, raised the price of butterfat to an extreme record high of $3.25/lb. Inventory levels are extremely low driven by high exports earlier this year and by stagnant production levels to date. 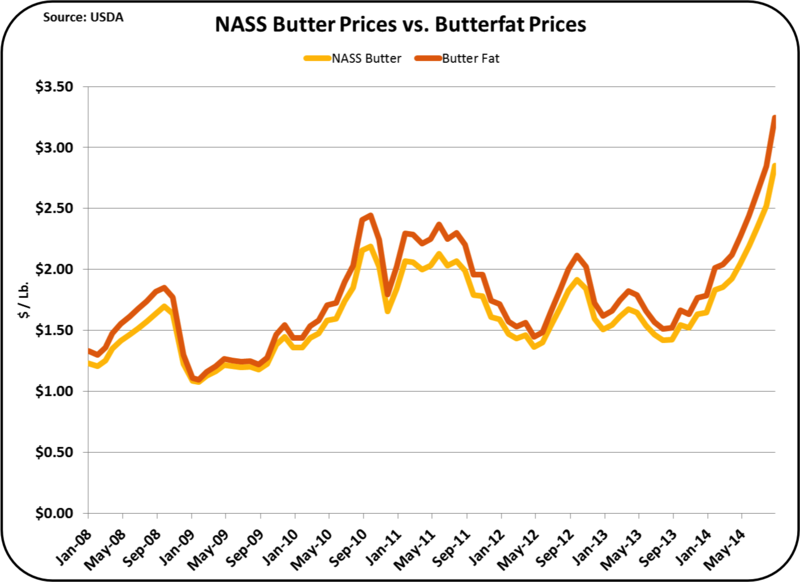 An adjustment will occur between supply and demand, but for now, the high demand and stagnant production are forcing extremely high butter and butterfat prices. More details on the butter market were reviewed in the August 10, 2014 post to this blog. There are consumption alternatives to butter and the high butter prices could drive consumers to trial other spreads and perhaps never return to butter. These trends will be followed as data becomes available. 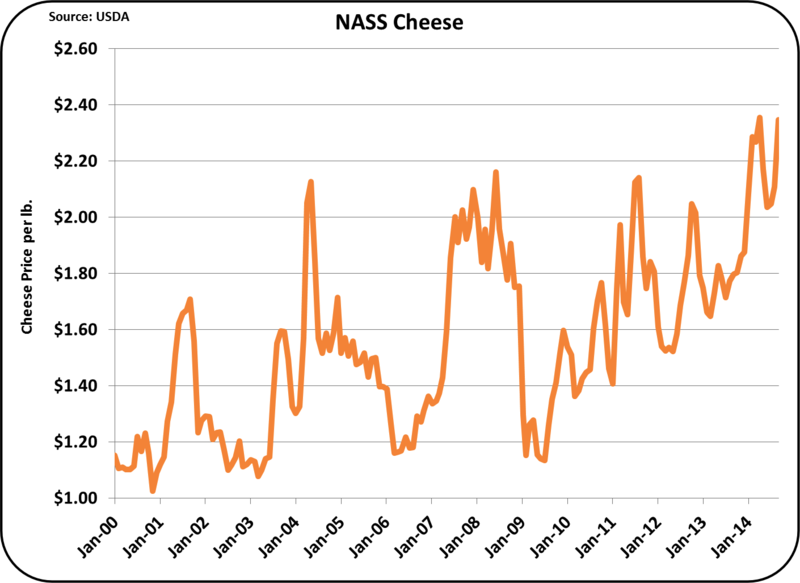 Cheese prices were also near record levels at $2.35/cwt. Production continues to grow, inventories are at reasonable levels, exports continue to grow and domestic consumption continues to grow. The only concern here is that high cheese prices at the retail level have been shown to reduce domestic consumption. The wholesale prices shown below will drive a higher retail price, and slow the growth of per capita domestic consumption. The bad news in the current dairy prices is Nonfat Dry Milk (NDM). NDM is the basis for the Class IV milk price. The majority of NDM is exported, so the price really reflects the international price, which has been falling. The current price of $1.47/lb. is well below the March 2014 high of $2.09/lb. 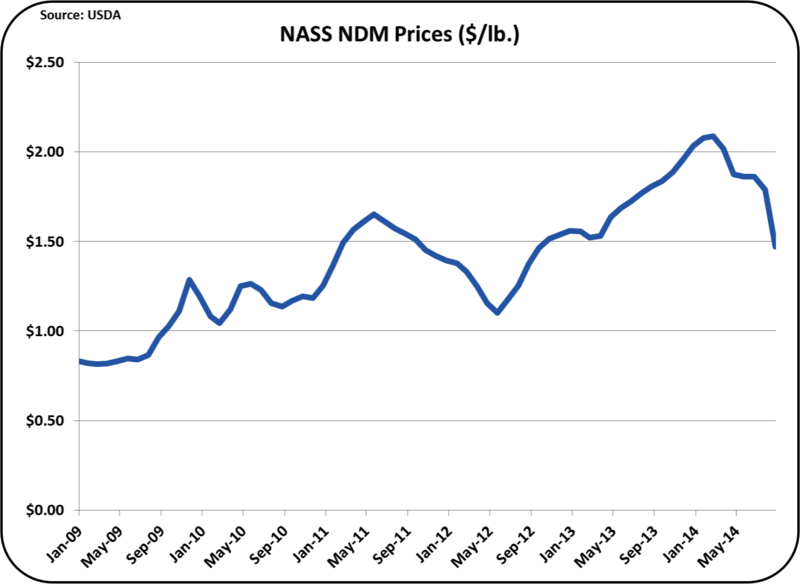 In early 2014, NDM and the Class IV skim price were driving the overall high milk prices. At $11.62/cwt. of skim milk, the current price is still a good price, but not near record levels of $17.12/cwt. set in March 2014. Unfortunately, inventories are starting to grow which combined with lower international prices, will probably drive the NDM price down further. The producer price paid for "other solids" has been contributing nicely to the overall Class III milk price for the last three years with prices around $.50/lb. The basis of "other solids" pricing is the price of dry whey. 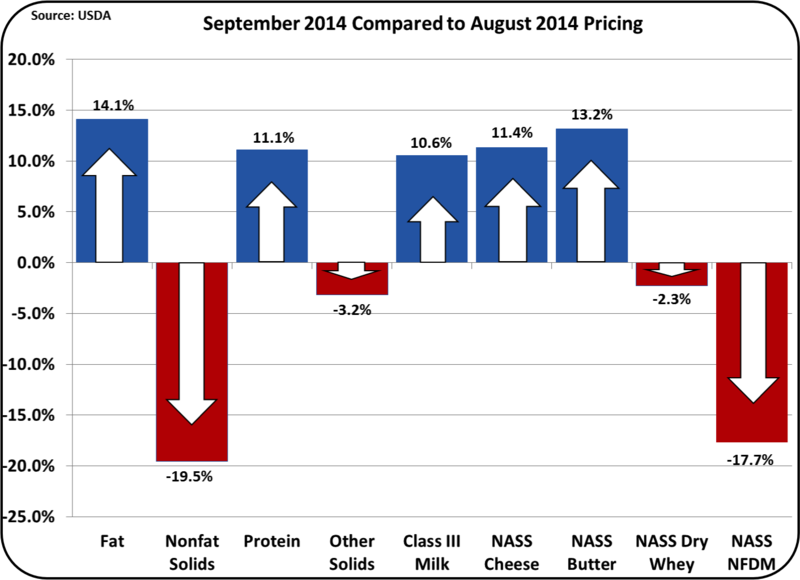 Dry whey continued to maintain a good value in September with a price of $.67/lb., up 14% over the 2013 average price. The majority of dry whey is exported, so this price reflects the international price. The long-term trends are difficult to read with the recent volatility. The current butter shortage is skewing the data. It is keeping butterfat prices very high and preventing growth in the most valuable part of milk, protein. For more on the future value of various milk components, see my article in Progressive Dairyman. The high price of butter will change, but the data will remain and influence the trend lines. The following pie chart of the component contributions to the Class III milk price, shows an ever more skewed distribution. 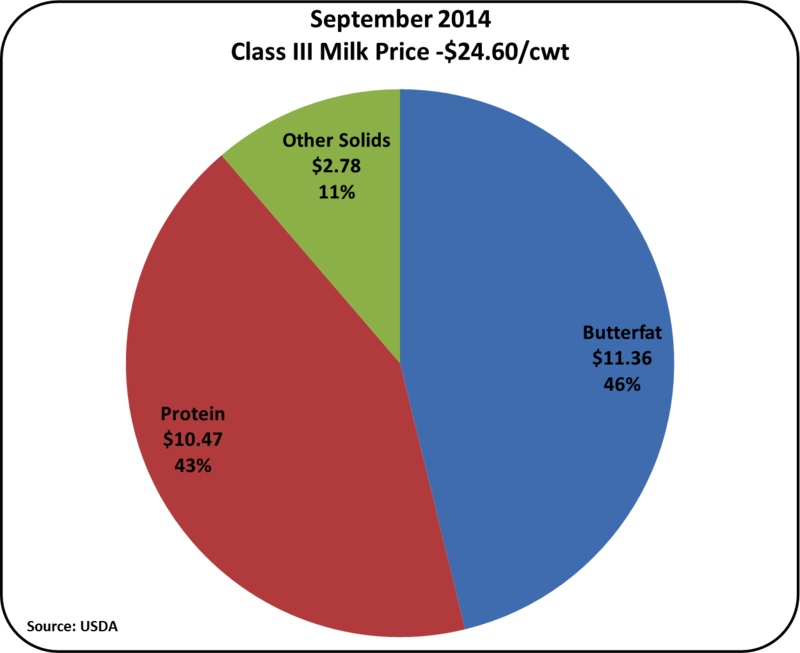 In September, butterfat contributed the largest value, making up 46% of the Class III price. "Other solids" continue to contribute around 11% to the Class III price, and milk protein showed a significantly smaller contribution at 43%. As mentioned above, the increase in butterfat prices has a negative effect in the value of protein. The high price of butter significantly changes the pie chart of income. The high price of butter does not significantly influence the Class III milk price, but it does alter the skew between the contribution by milk protein and butterfat. For a review of this relationship, please see the April 23, 2014 post to this blog. Exports are increasingly influencing the U.S. dairy industry. In the first seven months of 2014, 16.4% of milk solids were exported. Unfortunately, international involvement increases the pricing volatility of the U.S. dairy business. Right now it is very positive, but as seen in 2008/09, this could reverse. For more on exports, read my recent publication in the Dairy Reporter.